WHAT IS THE WALK TO FEED THE HUNGRY? The walk gives us the opportunity to come together for a special afternoon of visiting and learning about different Buddhist sangha-s in the area and meeting new people as we raise funds for Buddhist Global Relief (BGR), an organization inspired by Bhikkhu Bodhi and founded on the mission of combatting chronic hunger and malnutrition. Funds raised by the walk help BGR with their projects to provide direct food aid to people afflicted by hunger and malnutrition, promote ecologically sustainable agriculture, support the education of girls and women, and give women an opportunity to start right livelihood projects to support their families. 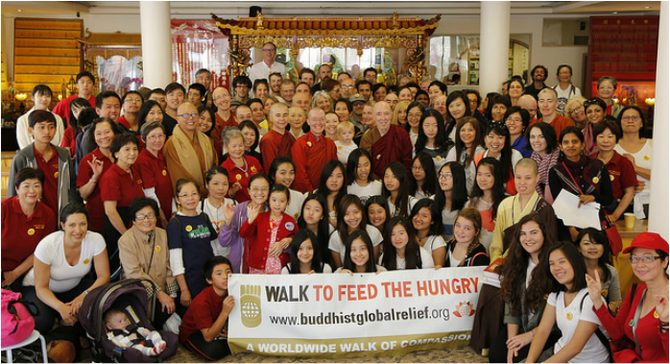 To learn about the projects that Buddhist Global Relief makes possible, visit www.buddhistglobalrelief.org. Every year these walks take place around the world and offer us the chance to come together to express compassion in action by providing support to people struggling with poverty around the world and in our own communities. Besides supporting BGR's projects all over the world, 10% of the Berkeley donations will stay local and go to Alameda County Community Food Bank. Please bring a water bottle, sun-hat, and whatever you need for your walk. If you can, please wear a white shirt so on the busy streets of Berkeley we can be identified as a group. People are encouraged to join in or depart as they need during the walk. It will be a time for practice, mindful walking, spreading loving kindness, making spiritual friends, and exercise. Many groups will help support the Walk such as: Aloka Vihara, Berkeley Buddhist Monastery, Berkeley Buddhist Temple, Berkeley Zen Center, Dhammadharini, Empty Gate Zen Center, Insight Meditation Community of Berkeley, Insight Meditation Center, Mission Dharma, San Francisco Insight, and San Francisco Zen Center. See PHOTOS from last year's walk. Getting there: Public transportation and carpooling are encouraged. The Dharma College is one block from the Berkeley BART. Parking: Allston Way Garage - 2061 Allston Way or parking at 2020 Kittredge Street. You can also use Luxe.com valet services to park your car and deliver it to you at the end location for about $5/hr. Register for the Walk: After registering with FirstGiving, participants have the option to create their own fundraising page where they can enlist the support of friends and family.